Despite recommendation to indict Netanyahu, Likud continues to gain in polls, while Labor, Yesh Atid fall. Prime Minister Binyamin Netanyahu would easily win a fifth term as premier if new elections were held today, a new poll shows. The survey, conducted by the Smith Institute and published by Maariv on Friday, shows the Likud party continuing to gain ground, rising from the 30 seats it won in 2015 to 34 mandates if new elections were held today. The previous Smith Institute poll, released on May 1st, showed the Likud winning 32 seats. 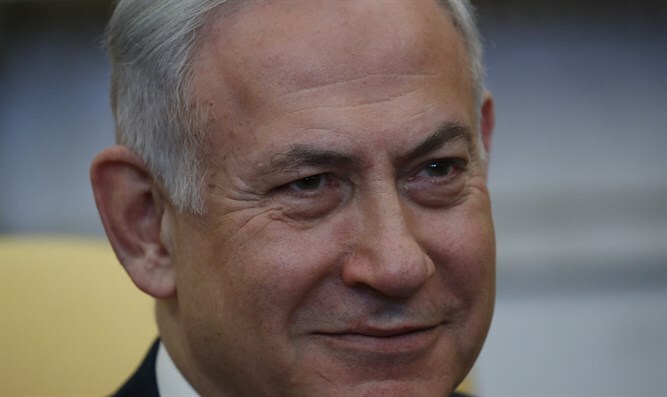 Despite a police recommendation to indict Netanyahu in February, and reports Attorney General Avichai Mandelblit may be preparing to indict the Prime Minister’s wife, Sara Netanyahu, the Likud has improved its position over the past few months. Some have attributed this rise to the escalating tensions between Israel and Iran, and the tensions with Hamas along the Israel-Gaza border. Earlier this week, terrorists in Gaza launched several waves of rocket and mortar attacks on Israeli border towns. Others have suggested that Netanyahu has benefited politically from the recent relocation of the US embassy from Tel Aviv to Jerusalem, and the subsequent embassy moves by Guatemala and Paraguay. While the Likud has risen in the latest Smith poll, Netanyahu’s most likely challenger for the premiership – former Finance Minister and Yesh Atid chairman Yair Lapid – lost ground, with Yesh Atid sinking from 19 seats in last month’s poll to 17 mandates. Nevertheless, the party would still improve upon its performance in the 2015 election, when it won just 11 seats. The Zionist Union, a united list which includes Labor and the smaller Hatnua faction, fell from 12 seats in last month’s poll to just 11 mandates. The Zionist Union won 24 seats in 2015. The predominantly Arab Joint List party would lost a single seat if new elections were held today, falling from 13 seats to 12 - the same number of seats last month’s Smith poll predicted the party would win. Education Minister Naftali Bennett’s Jewish Home would gain a single seat, rising from 8 to 9 mandates. Last month, however, the party polled at 10 seats, according to the Smith survey. Defense Minister Avigdor Liberman’s Yisrael Beytenu party, which won six mandates in 2015 but lost a seat in 2016 when MK Orly Levy split, rose in this week’s poll from the six mandates it was projected to win last month to eight seats. Among the haredi factions, the Ashkenazi United Torah Judaism would retain the six seats it won in 2015 – down from the seven seats the party was projected to win last month. The Sephardic Shas party would fall from the seven mandates it won in 2015 to just five seats. This represents an improvement, however, over the party’s showing in last month’s poll, which projected Shas barely passing the 3.25% minimum electoral threshold with 4 seats. Finance Minister Moshe Kahlon’s Kulanu party would win 7 seats if elections were held today, the same number projected in last month’s poll. The party currently holds 10 seats. Breakaway MK Orly Levy, who bolted from Yisrael Beytenu in 2016, would win five seats at the helm of a new party. Last month, the Smith poll showed Levy’s party winning four seats. The far-left Meretz faction would win six seats if new elections were held today – a gain of one seat in comparison to the five seats Meretz currently has, but a decline of one mandate compared to last month’s survey.